Port Dickinson Elementary students have been challenged to perform random acts of kindness to help others during the month of February. During Morning Program on February 11, Mrs. Busch and Cole Busch, the mother and brother of Cooper Busch or “Super Cooper,” helped to kick off the challenge and spoke with students about how these acts can make a positive difference. “It doesn’t take a whole lot to make someone smile,” Mrs. Busch added. For their challenge, students received a paper to be filled out with what they did, who they did it for and a drawing of either the act they performed or the smile on the face of the kind act’s recipient. 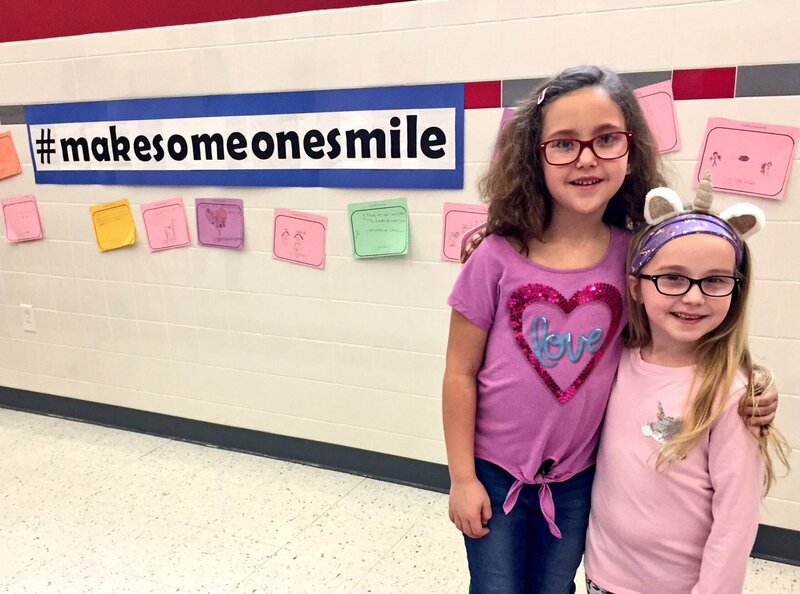 Students' papers will be displayed in the school under a sign that reads #MakeSomeoneSmile. In addition, students received a free pass to attend the “Cooperpalooza St Baldricks Event”, taking place on Sunday, February 24 from 1:00 – 4:00 p.m. at the Touch of Texas. The goal of this fundraiser is to bring awareness to childhood cancer and raise money to perform more acts of kindness to help others throughout the community. Port Dickinson’s “words of the month” are friendship and compassion. Two words that go hand-in-hand with random acts of kindness. We greatly appreciate the friendship and compassion shared by Mrs. Busch and her family. As of February 13, the #MakeSomeoneSmile wall was already starting to grow!